Already finished all of our picks for the best books of October? If so, that's great news, because there are a whole bunch of new books to dive into in November. 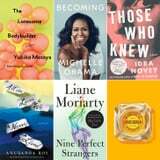 In addition to the highly anticipated memoir from former First Lady Michelle Obama, there are some heart-pounding mysteries and thrillers, as well as some gorgeous collections of short stories to keep you entertained throughout the last few weeks of Fall. Take a look to see what's new in literature!